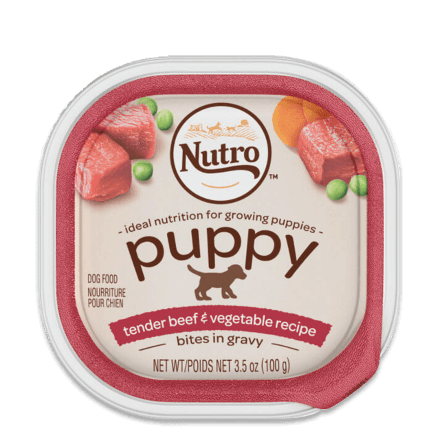 NUTROTM PUPPY Tender Beef & Vegetable recipe Cuts in Gravy is ideal nutrition for growing puppies. This natural dog food offers complete nutrition, rich in nutrients and full of flavour. Best of all, NUTROTM Food for Puppies is crafted for Healthy Skin & Coat, and has balanced protein and fat for optimal growth to nourish Healthy Development for your puppy. NUTROTM Quality Pledge: Natural ingredients carefully sourced from our trusted network of farmers and suppliers, no chicken by-product meal, soy, artificial flavours or preservatives. Beef Broth, Beef, Beef Liver, Chicken Wheat Gluten, Pork Plasma, Corn Starch, Sunflower Oil (preserved with mixed Tocopherols), Dried Peas, Dried Carrots, Ground Rice, Salt, Tricalcium Phosphate, Sodium Phosphate, Potassium Chloride, Calcium Carbonate, Caramel Colour, Brewers Dried Yeast, Fish Oil (preserved with mixed Tocopherols), Xanthan Gum, DL-Methionine, Guar Gum, Zinc Sulfate, Ferrous Sulfate, Vitamin E Supplement, Zinc Oxide, Chicory Pulp, Sodium Ascorbate, Choline Chloride, Taurine, Beta Carotene, L-Carnitine, Copper Proteinate, Manganese Sulfate, Sodium Selenite, Thiamine Mononitrate (Vitamin B1), Potassium Iodide, Vitamin A Supplement, Vitamin D3 Supplement, Biotin, Vitamin B12 Supplement, Riboflavin Supplement (Vitamin B2). These are the recommended feeding amounts based on the ideal body condition for puppy dogs of various weights. Individual dogs' energy requirements may differ. Adjust the amount fed to obtain or maintain your dog's optimum weight. Keep fresh drinking water available at all times, provide plenty of exercise and see your veterinarian regularly. Puppies up to 4 months: Feed suggested daily amount in 3-4 meals per day. 4 months to adult: Feed in 2-3 meals per day. Pregnancy/Lactation: Feed 2-3 times the amount shown for puppies 4 months to adult. Refrigerate unused portion up to 3 days. Refeed at room temperature. Provide fresh drinking water. 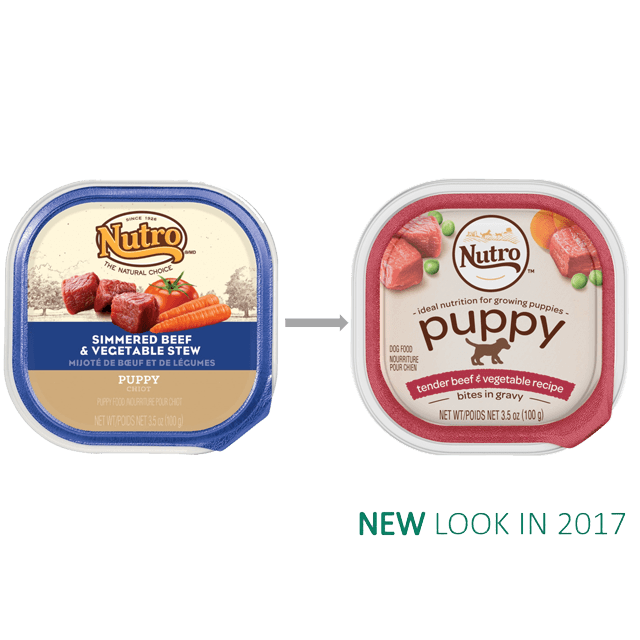 NUTROTM PUPPY Tender Beef and Vegetable Cuts in Gravy Puppy Food is formulated to meet the nutritional levels established by the AAFCO Dog Food Nutrient Profiles for growth & reproduction including the growth of large size dogs (70 lbs. or more as an adult). Feed adult dogs 1 1/4 to 2 2/3 trays daily per 5 lbs. body weight daily. Feed pregnant/nursing dogs 2 - 3 times that amount. Adjust to maintain ideal body condition.